12-03-08 — Though I devote a great number of words on this site to trees and shrubs, and their vast importance in landscape design, I’m still very much a lover of perennials. They flower, after all, generally with more aplomb than do annuals, trees and shrubs, and while “the bloom thing” is something that will influence your gardening style less and less as you advance in experience, there probably will never come a time when you garden without them. This month I offer suggestions on two different approaches to designing with perennials. 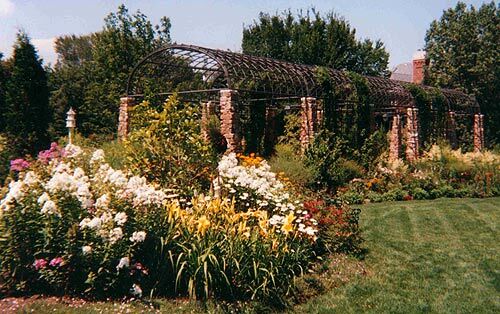 If it worked three hundred years ago, it works today: A traditional perennial garden remains one of the most desired landscape features in America. This is an area as small (as little as fifteen square feet, I guess) or large as you choose. Perennials can pack a powerful punch when planted en masse, but you need to master placement as you plant. Not the actual first garden I planted, but close enough. The first placement consideration is where, as a whole, the perennial garden will be planted. My first perennial garden was an oval-shaped affair cut into the lawn where my driveway joined the street. Totaling perhaps forty square feet, I amended the soil and filled it with perennials. It packed a rather wimpy punch. What it lacked was a backdrop. There’s a reason why circles or ovals cut into lawns and filled with perennials (or annuals, or both) tend to underwhelm. These gardens lack backbone, some form of structural backdrop (trees, shrubs, a hedge, the house, a wall, a fence, bench, fountain or sculpture) with which to dance and show off. I should have made the area a bit larger and planted the garden in front of a swath of shrubs. 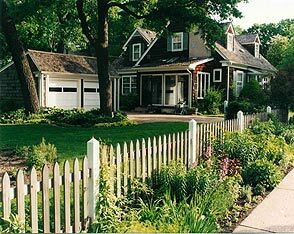 Even when placing a perennial garden in front of a garage, house or fence, I suggest planting shrubs first, then planting the perennial garden in front of the shrubs, if space allows. Winter interest has more than a little to do with that. After deciding on location, individual placement of perennials within the garden is the next concern. Here, in order of importance, are the four considerations I make when selecting perennials and choosing how to arrange them: 1) Creation of strong contrast between plant forms and foliages. 2) Mature height—tallest in back, shortest in front, mid-height plants front and middle. 3) Bloom period—I want something in bloom each day, May through October. 4) Flower color and contrast of flower colors. Note that I consider plant form and foliage first, flower color last. A majority of perennials are in bloom only two to three weeks, while the foliage is in view the entire season. Plant form refers to its shape. Is the plant upright (delphinium, tall phlox), mounding (geranium, coreopsis), mat-forming (sedum and lysimachia varieties) or something not quite any of these (a whole lot of perennials)? 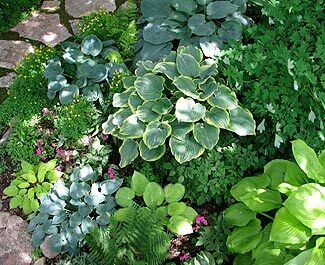 Selecting perennials that give your garden a wide range of foliage colors (yellow, gold, blue, gray, silver, reddish, brownish, lightest green to darkest green, variegated), foliage sizes (large- to tiny-leaved), foliage shapes (rounded, oval, slender, lobed, serrated) and foliage textures (glossy, dull, smooth, veined, lace-like), then placing them so as to create a contrasting tapestry of foliage is three-quarters of the battle toward creating a stunning perennial garden. First consideration: striking contrast between foliage. Make contrast in plant form a consideration also. 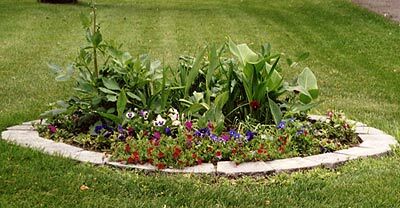 Two different types of low, mounding perennials planted side-by-side, even if their foliages contrast well, won’t sizzle like one low, mounding perennial planted in front of a swath of slashing, sword-like iris. Consider mature height of each perennial as you weave your tapestry. Tallest plants go in back, shortest in front, experiment with placing mid-size perennials in the middle but also occasionally elbowing to the front. Mix up the heights a bit. You don’t want the height of each perennial so carefully gradated front-to-back that the whole thing looks like a church choir on risers. Second consideration: height of each perennial at maturity. Choose perennials that will give your garden constant bloom. Often described as one of the greatest challenges in gardening, I find it the simplest thing in the world. Read the plant tag, ask at the nursery, then buy a few things that bloom in May, some in June, some in July, etc. Why is this tough? Third consideration: something in bloom each week of the season. So how many of each type of perennial do you plant? 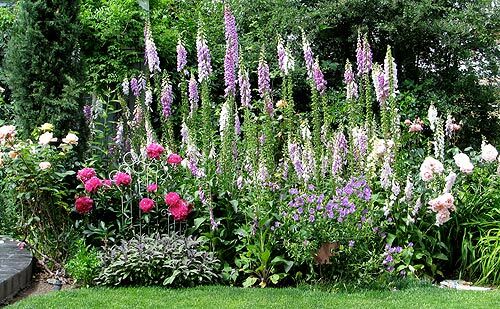 That’s up to you, though you’ll find that the larger the area, the more multiples of each perennial should be used. Planting in threes or fives is helpful, although if you create a spot that will fit only two of the same perennial, plant two. One, two, three, four or seventeen of the same perennial, after three seasons they all look like one clump. Here’s the best tip you’ll read in a garden design article all year: While still in their pots, place your perennials throughout the planting bed. This is how the pros do it. It enables you to shift the plants around, experiment with different foliage combinations, even quit, go to bed, and see what you think the next morning after a cup of coffee. I call it, “painting on site,” and this trick will always lead to a better-looking perennial garden than if you first draw a planting design. I never draw planting designs for perennial gardens that I create for clients. It’s a complete waste of time. Instead, I estimate the number of perennials needed to fill the bed, select them per my criteria above (wide variety of foliage shapes, sizes, and colors, with cursory consideration of a flower bloom pallet), then place the potted perennials in the bed, rearranging, shuffling, and experimenting, until I love what I see. If you have three of one perennial, try placing them in a triangle, then try a softly curving line. Five or more of one perennial, place them in a roughly circular grouping, or try a long, curving swath. 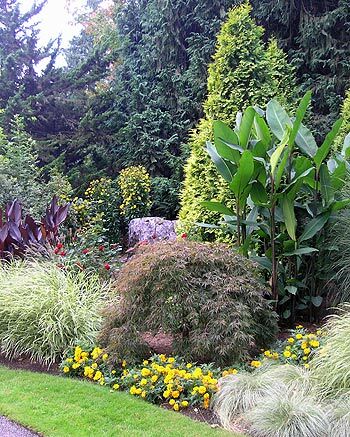 Always look for strong contrast between the plant form and foliage between each grouping. Pay strict attention to suggested spacing. Most perennials should be planted eighteen inches apart; some larger-clumping varieties need even wider spacing, some petite perennials, less. For large perennial gardens, plant in swaths. When the plants have been placed how you like them, pick up the first pot, dig a hole, plant the perennial. 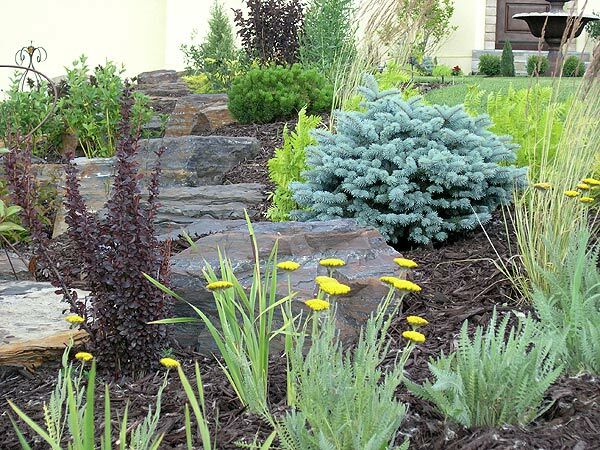 Remember that when finished, your new perennial garden will look gorgeous—and a little sparse. You must give the perennials proper room to grow, expand, and fill in. Just wait until you see it in years three and four! Call it the anti-perennial garden. 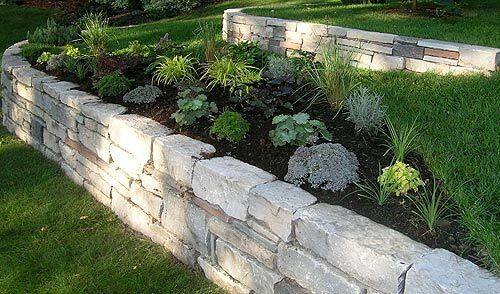 Instead of massing perennials together in one or more distinct beds, this design style calls for sprinkling your perennials here and there throughout the landscape, as singles or in groups of three, five, whatever the space dictates. Each perennial, or small grouping, serves the same role as a colorful throw pillow on a couch, or bowl of fruit in the middle of a long, oak dining table. What serves as the couch or table? Shrubs and small trees. The design emphasis is on ample use of these larger types of plants, with perennials tucked in to fill the gaps. Pop in a perennial or three near the base of a shrub or tree and the first factor that starts working in your favor is variety of scale. In height, perennials lie roughly in the eight-inch to three-foot range. 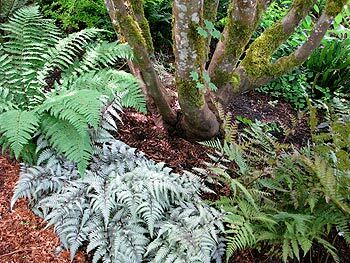 Massed, perennials will give you some noticeable variance in height as the eye travels from plant to plant, but nothing so bold as a low skirt of Tiarella at the base of a clump birch, or a twenty-four inch tall blast of Achillea (yarrow) in front of an eight-foot, upright juniper. The second design advantage to using perennials as accent plants is your ability to create strong statements of foliage contrast. 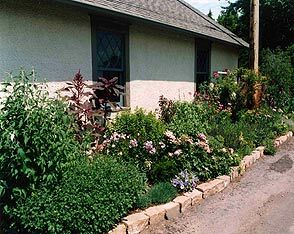 In the perennial garden, placing your plants so that there is strong contrast in foliage size, shape, texture and color between perennial varieties is the primary concern. Now add the vast range of foliages available from evergreen and deciduous shrubs and small trees, and the possibilities become endless. 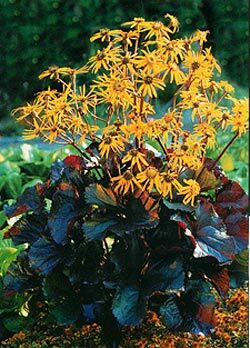 The eye-catching, intense yellow leaves of Heuchera ‘Pistache’ will dazzle when framed by a swath of any taller perennial with dark green leaves planted behind it, but the same Heuchera nestled at the base of a dark green, spreading yew is even more arresting. Whereas the color contrast (yellow and dark green) remains the same, the needle-type foliage of the evergreen yew contrasts more decisively than it would with any deciduous leaf. 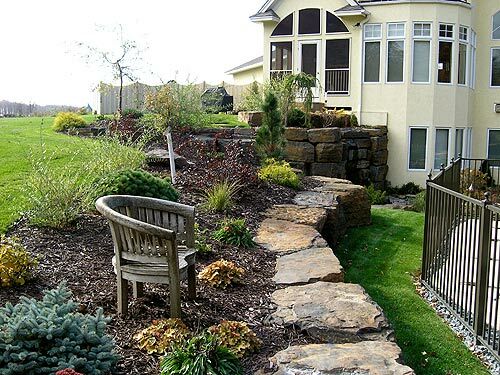 A mixed perennial-shrub-boulder design and installation job of mine, new home construction, Greenfield, Minnesota. Heading back to my throw pillow analogy, what you’re doing is decorating the room (the landscape of small trees and shrubs) with accessories (the perennials). As in interior design, the accessories never comprise a majority of the scene. In a lavish home, a large family room might be dominated by a grand piano, oak bookcases, an ornate desk, leather couch, matching stuffed chairs with coffee table, etc. The accessories—the globe stand, the ornate lamp on the desk, the small sculpture on the table, paintings on the wall—fill in the gaps. Granted, this is a gardening style that some don’t admire, or rather, some readers will decide they enjoy perennials massed together more than when used as accents. But in my development as a gardener and landscaper, I’ve come to realize that placing a heavy emphasis on shrubs and small trees (particularly dwarf evergreens) and less emphasis, frankly, on massed perennials to fill the space on the property leads to a more majestic view. Above: Close-up view of the Greenfield job. Left: Annuals, perennials, tropicals, yes, but it’s the Japanese maple, the Yellow Ribbon arborvitae and the backdrop evergreens that make the scene soar. Minter Gardens, British Columbia. Readers who have experimented with boulder outcroppings in their landscapes understand this. Here, the boulder serves the role of a shrub. 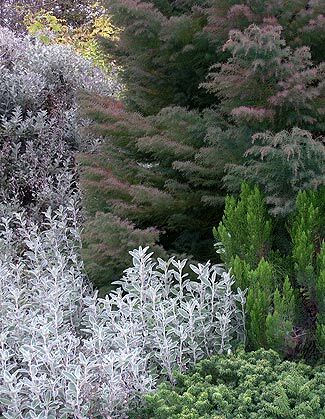 A single clump of Perovskia (Russian sage) arching its delicate blue-gray leaves and stems in front of a gruff, pinkish granite boulder will look more glorious than any scene one could create by combining the sage with any perennial on the planet. 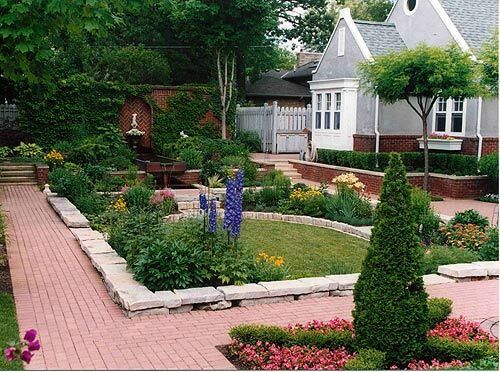 Bountiful perennial gardens, but note the strong use of hardscape, lawn, walls, small trees and shrubs that create backbone. What’s more, when used more sparingly as accessories, each perennial stands out. Because so many perennials have attractive and diverse foliage, they look good through the season—before, during, and after bloom. Just as important, by using more shrubs and small trees in your gardens, you are on your way to creating landscapes that retain interest and beauty twelve months out of the year. Above: Mixed border, Greenfield job. Left: This is why I call Zone 7 gardeners cheaters. Some variety of silvery, perennial Stachys that I can’t grow, flowing up and around some variety of plum-tufted evergreen that I can’t grow, either. Duh.